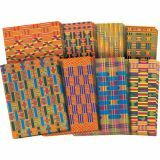 Explore traditional African textiles! Rich, authentic textile designs are printed on paper! 8 different prints with distinct characteristics. 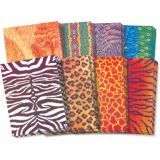 Design your own fashions with a spectrum of colors and textile patterns! Dress up paper dolls in high style. Perfect for making paper beads! 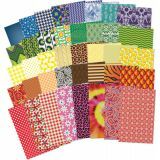 An excellent complement for Roylco's Paper Doll Pad. Each design appears to be hand painted. Brightly printed on quality cut-and-fold paper. 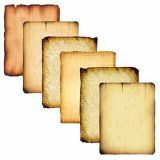 Use these antique parchment style designed papers to illustrate poems and short stories. Draw a beautiful family tree, Coat of Arms or realistic treasure map! 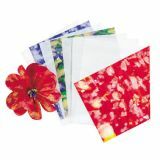 We have created this package of watercolor paper in collaboration with the Fresh Artists®Program. 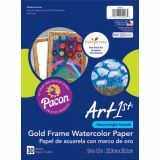 The package contains student grade watercolor paper adorned with a gold frame that will turn any work of art into a finished masterpiece! It's the perfect paper for all ages. Acid free. Recyclable. 30 Sheets per pack. 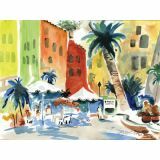 Art1st® Watercolor Paper, 12" x 18"
Heavyweight watercolor paper in an economical package. 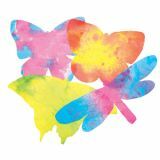 Perfect for Pre-K and student grade artwork. These sturdy sheets work well for wet and mixed media. Art1st®Watercolor Paper can also be found in Fresh Artist® programs, which help provide art supplies and funding to low-income schools while teaching children new ideas, new aesthetics and new art making skills. Acid free. 50 sheets. 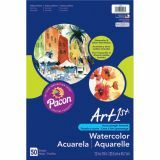 Art1st® Watercolor Paper, 18" x 24"
Heavyweight watercolor paper in an economical package. Perfect for Pre-K and student grade artwork. These sturdy sheets work well for wet and mixed media. 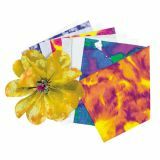 Art1st® Watercolor Paper can also be found in Fresh Artist® programs, which help provide art supplies and funding to low-income schools while teaching children new ideas, new aesthetics and new art making skills. Acid free. 18" x 24". 50 sheets. 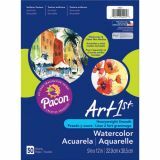 Art1st® Watercolor Paper, 9" x 12"
Heavyweight watercolor paper in an economical package. Perfect for Pre-K and student grade artwork. These sturdy sheets work well for wet and mixed media. Art1st®Watercolor Paper can also be found in Fresh Artist® programs, which help provide art supplies and funding to low-income schools while teaching children new ideas, new aesthetics and new art making skills. Acid free. 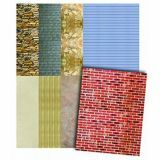 Eight realistic exterior textures are printed on glossy paper. Use them to enhance building collages, architecture art and 3-D sculptures. Easy to fold, cut and glue. Spray liquid watercolor paint or food color over fabric-like paper with interesting texture. Watch the colors flow and blend. Once the paint is dry, embellish with markers, crayons and glitter glue. Beautiful results are guaranteed! Great for all ages and skill levels. Spray liquid watercolor paint or food color over fabric-like paper with interesting texture. Watch the colors flow and blend. Once the paint is dry, embellish with markers, crayons and glitter glue. Beautiful results are guaranteed! Great for all ages and skill levels!